Not the sexiest name, I know, but trust me, it’s exactly what your holiday table is missing. 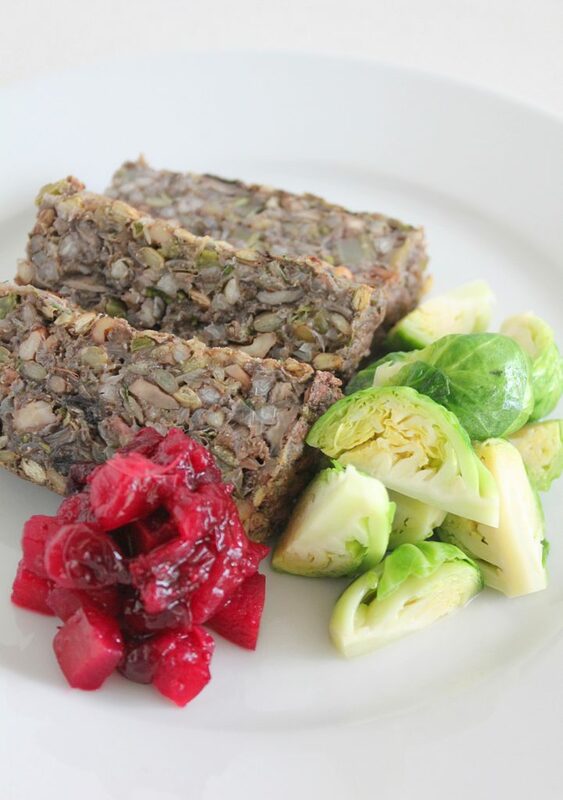 Have you ever spent holiday dinners eating Brussels sprouts, mashed potatoes and cranberry sauce? 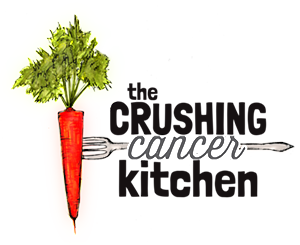 I have to admit, this sounds pretty good to me right now, but it is nice to have a thoughtful (non-turkey-shaped tofu disaster) addition to this for those who are on a health-conscious, plant-based path. Even those who eat everything around the holidays will like this recipe (I mean, probably not my Dad, but like, most people who like food). 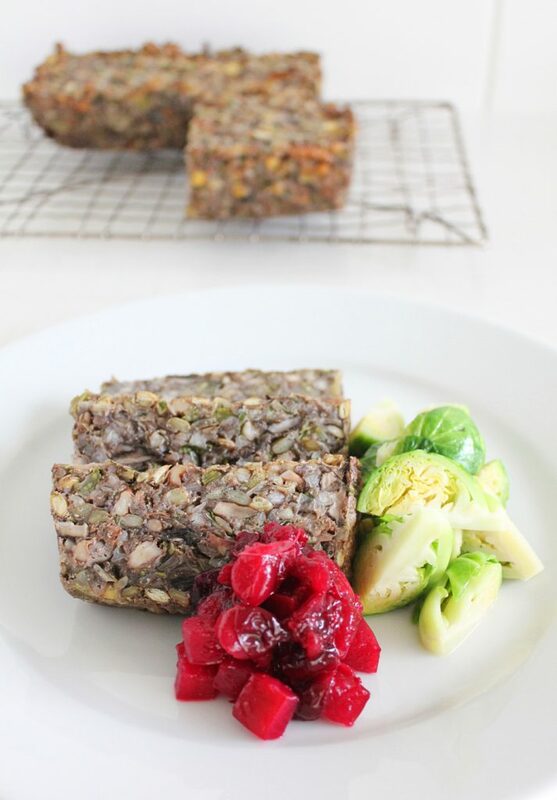 It has all of the flavours of a traditional stuffing, has a good hearty texture and could even be served in place of stuffing without any song and dance. 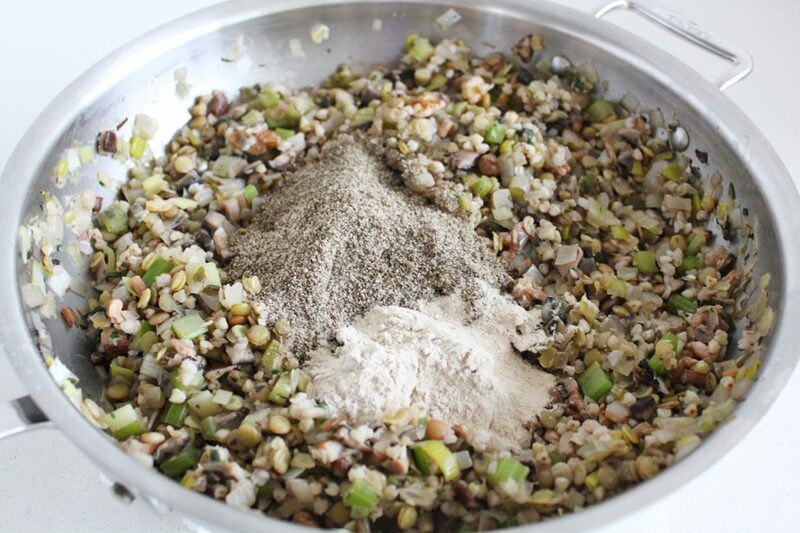 The lentils and mushrooms ensure that it is meaty and protein-rich enough to replace the roasted turkey (or roast beef or whatever) while the buckwheat gives it a doughy vibe that replaces any desire for highly refined bread-based stuffing. The fresh veggies are there in abundance (mushrooms! celery! onions! garlic! all of the fresh, immune-boosting Christmas herbs!) but you can’t really tell, so you will still feel like a big side of the Brussels Sprouts Casserole too. But the biggest secret of all is the glue that keeps it from falling apart. Lots of chia seed (that we grind up in a spice grinder or blender) and psyllium husk (available at health food stores and fancy, healthy grocery stores). 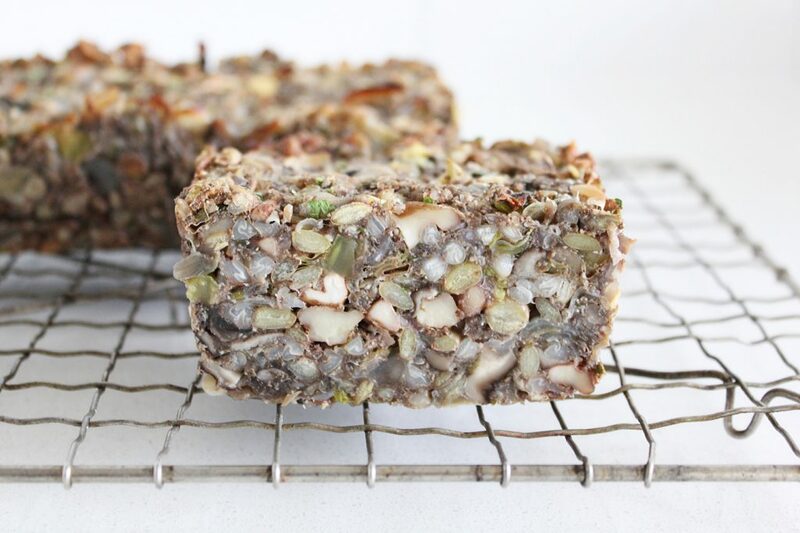 These two ingredients keep this loaf from falling apart, which is already amazing, but they also are FULLY LOADED with fiber and are even recommended as fiber supplements on their own. So you’ll be sending your guests home with fond memories and some regularity. I’ll thank you on their behalf. This ‘loaf’ (can you help me come up with a better word? Brick-shaped terrine maybe?) reminds me of the ‘dressing’ (stuffing that doesn’t see the inside of a turkey) that was often made around holiday time when I was working in nice restaurants. It was (usually kind of fancy) stuffing, mixed with eggs and then wrapped in parchment to make it round and then foil. It was then baked, cooled and sliced so that it could be pan-fried before serving. I guess you could go this route for our recipe too, if you’re feeling fancy. You could also make the loaves, cool them, dice them up, warm them in the oven and serve in a nice dish with a spoon (or on top of a platter of massaged kale, that would be awesome). OR, if you don’t want the set loaf vibe, make this recipe up until the point just before the chia and psyllium are added and just omit them. It will resemble a loose sauté of veggies, lentils, buckwheat and sunflower seeds, but you could stuff it into little acorn squash halves, or again, serve it warm with a spoon as a delicious, protein-rich side dish (be sure not to add the parsley until right before serving so that it maintains its green. A true bonus is that this loaf makes the best leftovers. We’ve been testing the recipe over the last few weeks and have been eating it warm (reheated in the toaster oven) in a collard with some Eggplant Mayo and this Cranberry Sauce. I’m going to be very sick of it by the time Christmas rolls around, and this baby might come out loaf-shaped, but at the moment, it is literally getting me/us through the craziness of the season. 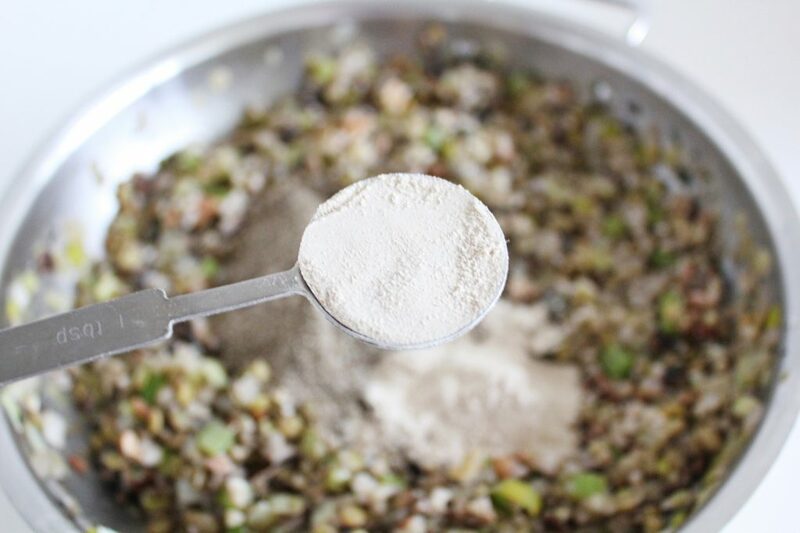 ½ c Puy Lentils (or any lentils), soaked for 8-12 hours, drained, rinsed and cooked with a small sheet of kombu. ½ c Buckwheat, soaked for 8-12 hours, drained, rinsed and cooked. 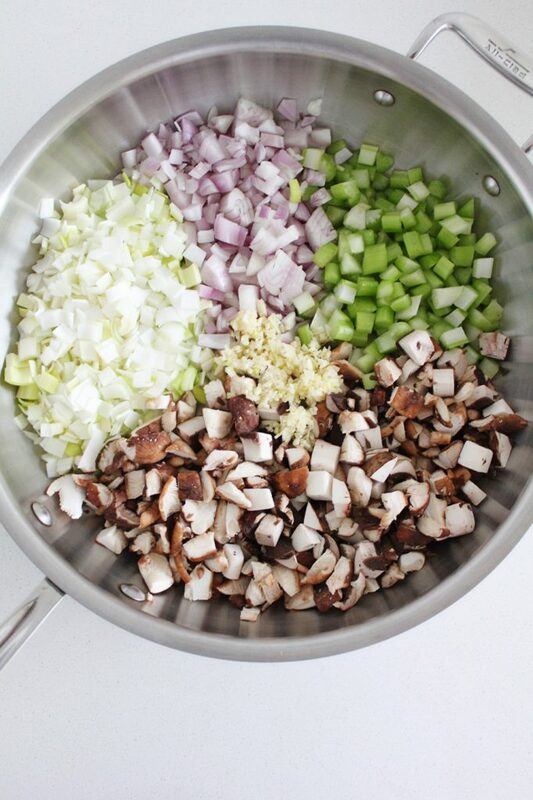 In a large frying pan, on medium heat, melt the coconut oil and sweat the onion, garlic, leek, celery, mushrooms, thyme, sage and rosemary until the onions, celery and leeks are translucent and the mushrooms are soft and have shrunk. 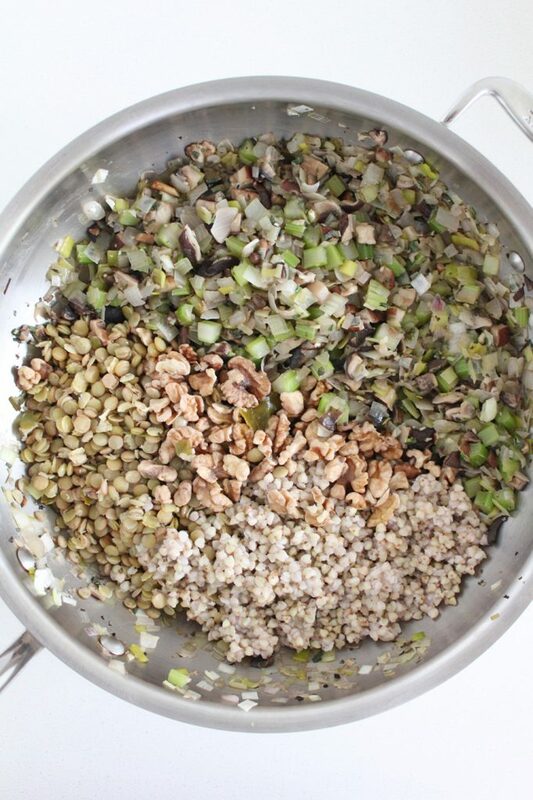 Turn off the heat and add the cooked lentils, buckwheat and sunflowers seeds. Mix together. The mixture should be quite dry (no liquid pooling on the bottom), if it's not, turn the heat back on until it evaporates. Transfer contents to a large bowl, add the fresh parsley and adjust seasoning to taste. Add the ground chia and psyium and mix well. 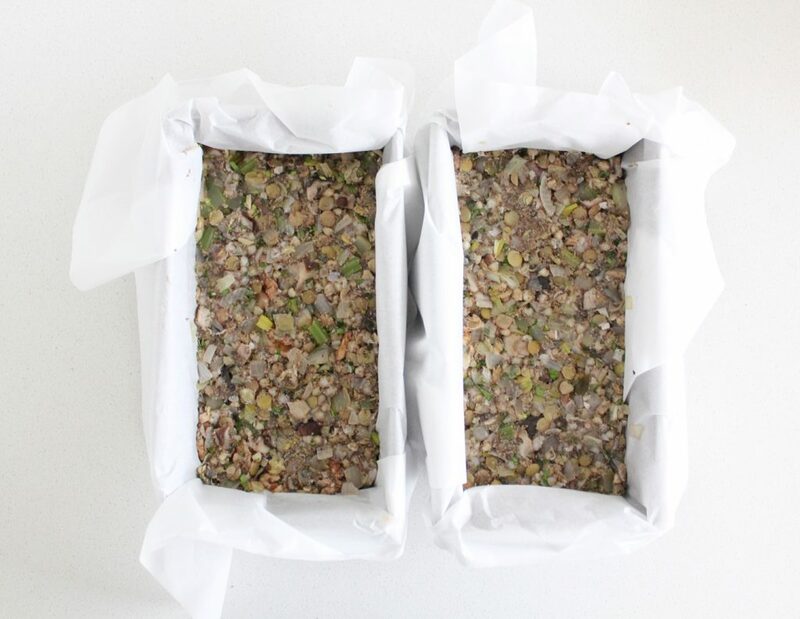 Firmly press mixture into two parchment-lined loaf pans. Bake for 45-50 minutes and let cool on a cooling rack. Slice (you can reheat the slices at this point) and serve (with miso/mushroom gravy and/or cranberry sauce). 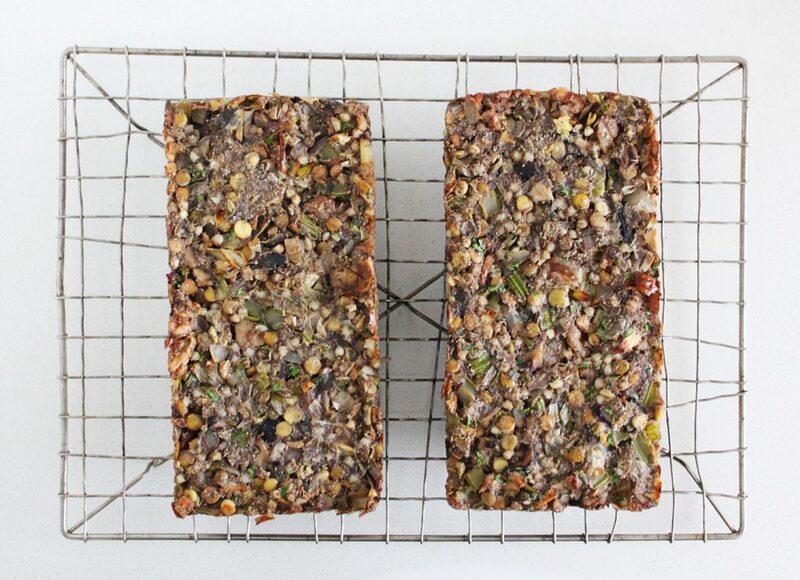 I just made this – because I only have one loaf tin I cooked one first. I’m glad I did. It was a bit under-seasoned. As a stove-top dish, it was really good, but I don’t really like the chia-seed and psyllium taste and once cooked it tasted lind of bland. So I have added some chilli poweder and tamari and some cracked pepper to the 2nd oneand because I have already made the mixture with the chia seeds and psyllium I will have to live with it!. I have already made a rhubarb and cranberry relish that I aways have at Christmas, so I will serve it with this. It did remind me of the meatload my mum used to make and I loved that as a kid. 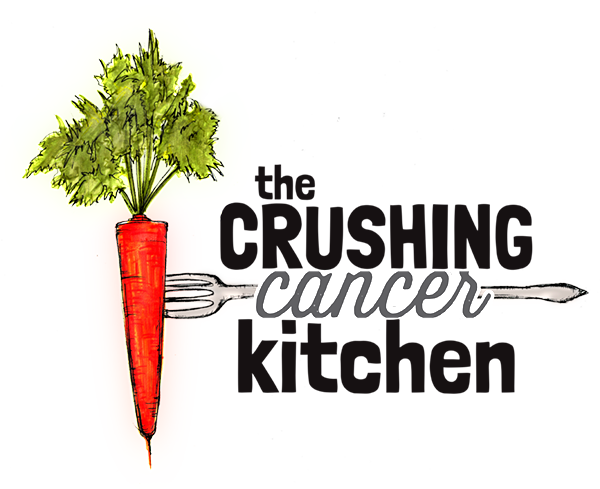 I don’t eat meat any longer, but I think it’s the sage that I love most about this. Mum used to put 2 tbsp tomato sauce in hers and then she rolled it is toasted breadcrumbs. 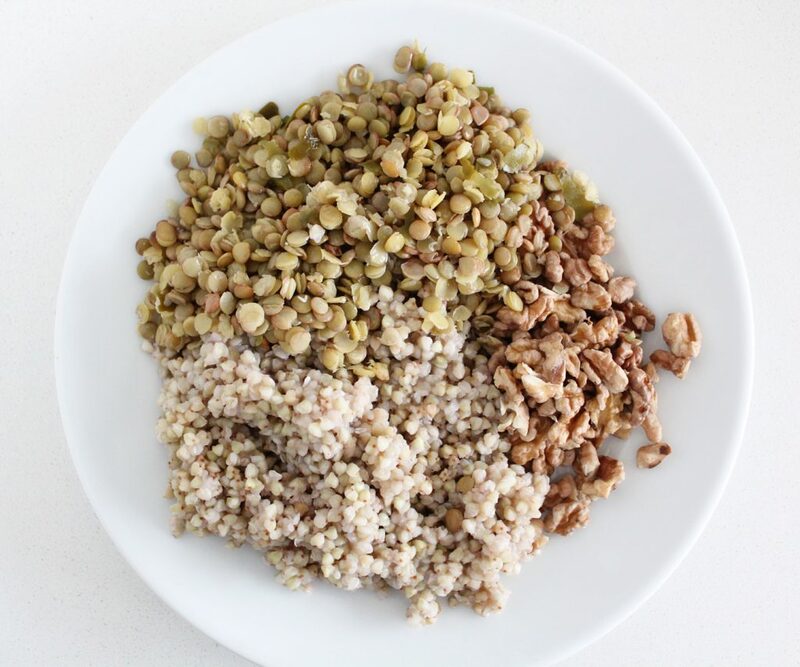 I think next time I make it I might toast the buckwheat and use less chia seeds and let it set, then coat it in the toasted buckwheat – maybe just on the top? Would that work? Hi Mer! I’m so happy to hear it :) Let me know what you think.